Photographing dogs is not the easiest thing to do. How do some people get such great pictures of their dogs while other people just get ordinary ones? When you realize that there are books written about photographing dogs it becomes apparent that it’s more than just a point an click process. Certainly Equipment does make a difference but there are many people who get that perfect shot with very simple cameras. We go back to the number one trait of any good photographer – patience. The other secret is that when you see the “perfect” picture it’s usually because there were a dozen or two photographs that weren’t! The best advice for getting a good picture of your Pug is to take a lot of pictures but learn from each set that you take. You’ll start to get an idea of what works best in terms of getting a good picture. Remember, when you are looking at a prize photo or a picture in a magazine, you’re looking at the best ones. You’re not seeing all the ones that didn’t make the cut. Don’t be discouraged by your results especially in the beginning. Photographing dogs can be very difficult. Anyone can take a picture, anyone can write and anyone can paint but to have results in those fields that stand out from the crowd you need to a lot of it and you need to learn as you go. How much time are you willing to devote to photography? If you’re just a casual photographer you’ll save yourself a lot of frustration by not expecting professional results. If you want professional results be prepared to spend a little time on learning the skills that you need to produce excellent results. Having said all of that, you don’t need to spend years of study or buy expensive equipment to produce pictures of your Pug that you’ll be happy with. Our preference is toward the natural, un-posed picture. Letting your Pug play naturally and training your camera on him so that you’re always at the ready will produce surprisingly good pictures. One other tip that we have found works well is to call out your dog’s name while he’s in the middle of something – it gets him to look up quickly toward you and many times can result in a great shot. 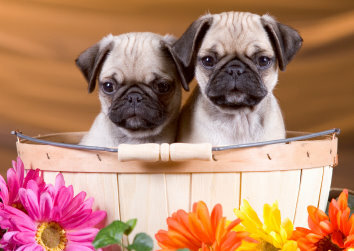 Pugs and children almost always make adorable pictures and, again, the key is for a natural setting. Pugs and kids have a great chemistry so just let them do their thing and snap away. As we discussed in the section on equipment, a digital camera can save you a lot of money in the long run and give you the ability to take a lot more pictures without worrying about the cost of developing and printing. They give you instant feedback and you can keep at it until you’re happy with your picture. With film you won’t know the results until you at least get the negative developed and even then you don’t really know everything until you see the actual print. Although not a necessity, a digital camera will help you capture the best picture of your little friend and everything else you want to take a picture of. Photographing dogs got a little bit easier with the advent of digital photography because you can easily see your results without printing every picture. That can become very expensive. Lighting is important because pictures of dogs can have that same annoying "red eye" look that humans do when pictures are taken with a flash. Bright, natural lighting is always the best because there won't be the "red eye" and the shutter speed will be fast enough to minimize camera movement. Lighting becomes especially critical when photgraphing Black Pugs. Their coloring, although beautiful, presents a particular problem because of the lack of contrast. Lighting becomes even more important with a Black Pug and, again, natural light is sometimes the easiest to work with. Of course, many people like a “formal” pose of their pet. This has gone out of style a little bit just as the formal family portrait has. If your Pug is a dog show candidate, however, a formal portrait makes a lot of sense. Even if your dog is not meant for show you may want to have a picture that is of a more formal nature. This is especially true if your Pug has a wardrobe. Not every dog likes to get dressed up but those that do can make a great picture. Pugs, in general, are one of those breeds that not only tolerate clothing but look rather comical when you get them in their outfit. Dog clothing is very poplular, A Pug in a hat or a tuxedo will definitely bring a smile to your face. Holidays are a great time for photographing dogs. Many owners dress their Pugs in special clothing for pictures and many owners feature their pooch on a greeting card. You can even have your Pug’s likeness on a t-shirt, bag or mug. Why not, they’re awfully cute! For a picture like this you want to make sure you have adequate lighting and an assistant will definitely help. That way one of you can position the dog and the other can snap the shutter. Your dog should be fairly obedient and respond to simple commands like “sit”. If you have a young Pug that is constantly in motion a formal portrait session can produce a long day. Photographing dogs of any kind can be a challenge but a young, active one can be a true test. In any picture taking you should also take note of the background and make sure there is contrast between your dog and his surroundings. The black Pug is a particular challenge in making all of his features stand out, especially the eyes. You want to have a very well lit scene and be fairly close to the dog. There is nothing like having nice pictures of your Pug to have around the home or office. It is well worth taking the extra time to “frame” your shot and create a photo friendly environment. If you have a camera that can take pictures at high speeds you’ll also be amazed at what these “freeze frames” can capture. Almost all animals in motion are a study of a graceful creature and your Pug is no different. Get a picture of your dog jumping up to grab a ball or running to jump over some small object and you’ll be amazed at how the features in your dog change, especially his face. Photographing dogs can lead to many years of enjoyment.